An international team of astronomers discovered a rectangular‑shaped galaxy within a group of 250 galaxies some 70 million light years away. “In the Universe around us, most galaxies exist in one of three forms: spheroidal, disc-like, or lumpy and irregular in appearance,” said Alister Graham from Swinburne University of Technology. 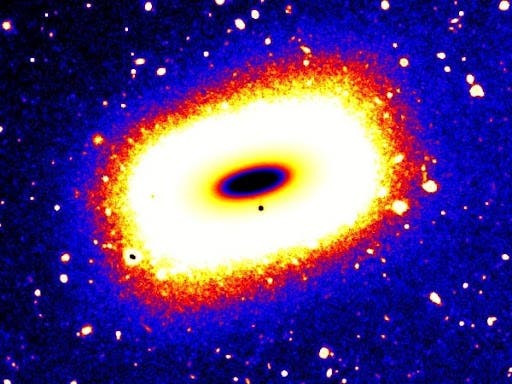 He said the rare rectangular-shaped galaxy was a very unusual object. The unusually shaped galaxy was detected in a wide field-of-view image taken with the Japanese Subaru Telescope for an unrelated program by Swinburne astrophysicist Dr Lee Spitler.The astronomers suspect it is unlikely that this galaxy is shaped like a cube. Instead, they believe that it may resemble an inflated disc seen side on, like a short cylinder. “This highlights the importance of combining lessons learned from both types of past simulation for better understanding galaxy evolution in the future,” said Associate Professor Graham.“One of the reasons this emerald cut galaxy was hard to find is due to its dwarf-like status: it has 50 times less stars than our own Milky Way galaxy, plus its distance from us is equivalent to that spanned by 700 Milky Way galaxies placed end-to-end.